shall i use an electric mixer to combine all ingredients together or just use a wooden spoon/ spatula/ hand whisk is fine? Thanks for sharing this recipe and i love reading your blog :-). 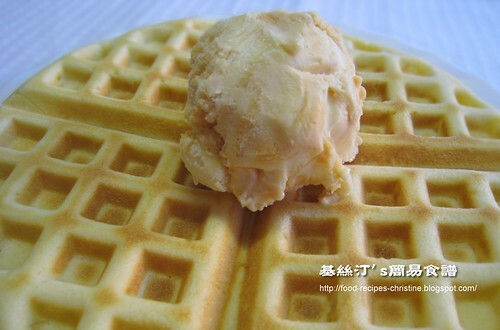 For making waffle, it doesn't matter if you use electric mixer or wooden spoon. Yet don't over-stir in either way. Just combine all the ingredients. Thanks for your love of my blog. You're more than welcome. Is 發粉 = baking powder or baking soda? Thanks. I am Chiu Yin from Malaysia. I love your blog very much. I saw some recipes beat the egg white with sugar till fluffy prior to the addition of egg yolk and flour batter. What is the difference between this recipe with yours? Is the mouthfeel of waffles made by this recipe will be more fluffy than yours? Or they are the same? I also noticed that the other way of adding beaten egg whites to the yolk/flour mixture. But I haven't tested it yet. Don't know whether that method would make a big differences in texture. Just wonder if the weight of the upper waffle heater would cancel the effect. Yeah, sure I will let you know the difference between these two recipes after my trial. I tried this recipe, it is awesone!! Thanks for sharing!! I tried and somehow the waffle is not soft at all....=( Anyone can help? You need to adjust the consistency of the batter. The mould should be heated up to the temperature first, then pour the batter over it. Don't cook it too long. Hi Christine,I lived in England ,I loved your blog so much and recomment to my friend so many time. The waffle make you user, is It the One English people use which is electric and looks like sandwich maker? Thanks for recommending my blog to your friends. My waffle maker is an electric one. I'm not sure if it is the one you see in England. Yeah, it looks pretty like an electric sandwich maker. 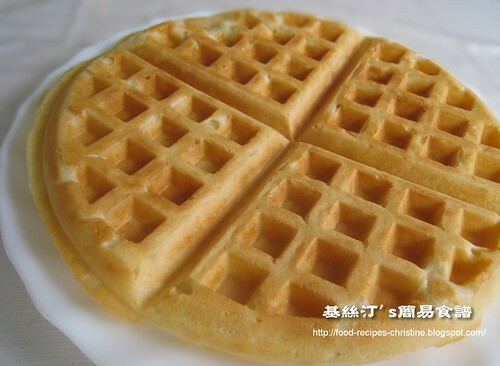 我很喜愛吃waffle, 幾年前買了一部waffle maker, 當初做出來的waffle 都成功的, 之後興趣減少,就把那waffle maker 收藏起來, 最近興緻又出, 便把它拿出來再用, 可是不知道為何, 所有出來的waffle都粘貼在電板上, 脫不出來. 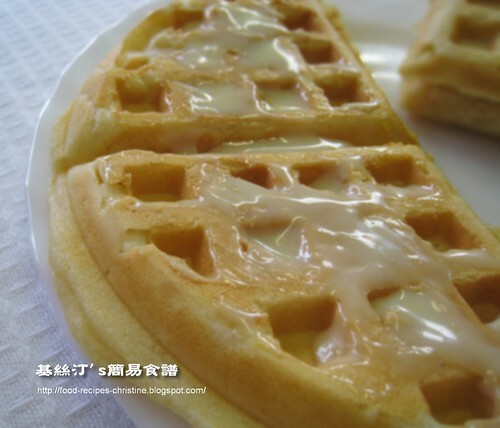 不知道 是用料問題還是部waffle maker 已經失去功能. hi christine, thanks for sharing this. how much the milk should be added? half-cup means? I tried to make waffles several times but they always sticked to the machine (and couldn't stay in shape after I pulled them out....). Actually the service of the machine was not scratched, do I need to use an oil spray (which I don't want to as I want to eat healthy) or is it because my machine is not hot enough?? Thanks! Suppose that your waffle machine is working fine and the coating is not damaged, you still have to heat up the machine according to the instructions on the manual. Mine has a light that will go off when the machine is hot enough. Then off you go, ladle your batter over the hot plate. For making the first one, I often need to grease some oil to help from sticking. But for the next one, I don’t need any oil at all because the batter has got some oil already. If you grease the machine with a brush, you have more control of how many oil you apply. Hope this info helps.